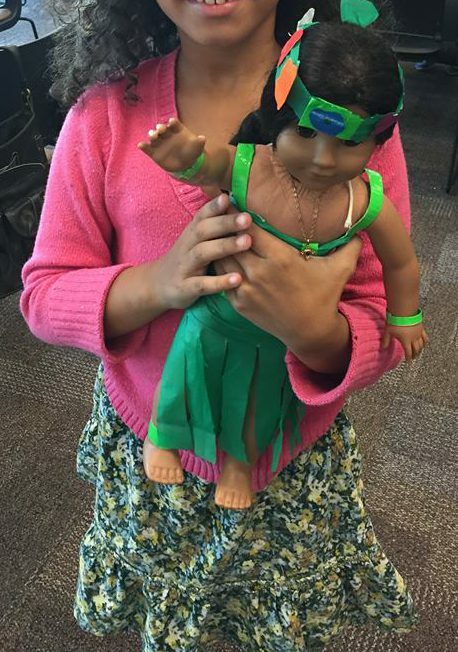 American Girl Nanea was a super simple program but so fun to do! I did my typical opening. I talked about where Nanea lived (Hawaii) and two popular items in Hawaiian culture. The first one was Mochiko. I talked about the cake’s origins and bit about how it is made. I then had everyone split into two groups, as we were going to make our own Mochiko. I had everything laid out on the tables. Then every child helped with making the cake. This was the most time-consuming portion. This ate up almost the entire first hour. After I had everyone’s pans, I was able to put them in the oven. While we waited for the mochiko to bake, we made leis. I talked about the history and etiquette of the lei. I then guided the kids into making their own lei. This were the instructions I used. By the time everyone was done with their leis, our cake was ready! 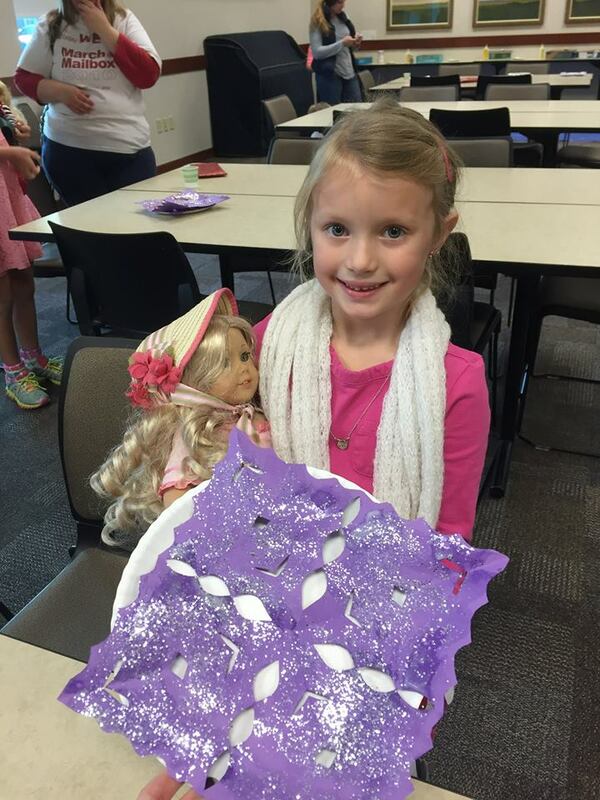 Our one and only American Girl program for spring happened to land on Earth Day. 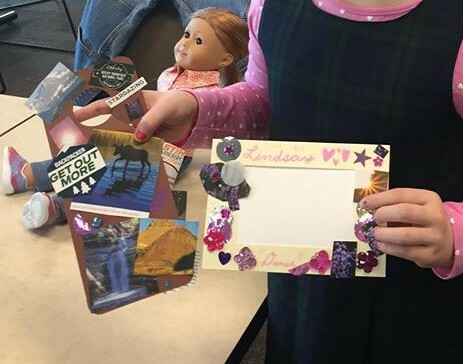 I felt that it was only appropriate to do a Modern Girl session by upcycling crafts that I already had around the children’s department. You can find a TON of activities to do for this kind of program. I had to limit myself to four of them. This program was also very loosely structured compared to my other American Girl programs. I wanted something other than a mobile for a CD project. 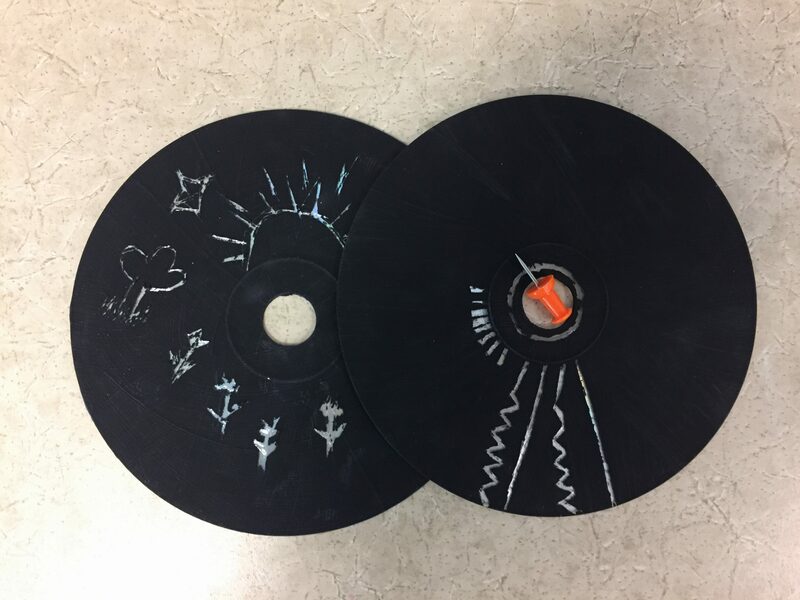 Researching, I found several sites where people painted CDs with black acrylic paint and then etched a design into them. As a library, we have a whole bin of old CDs and paint is always to be found. 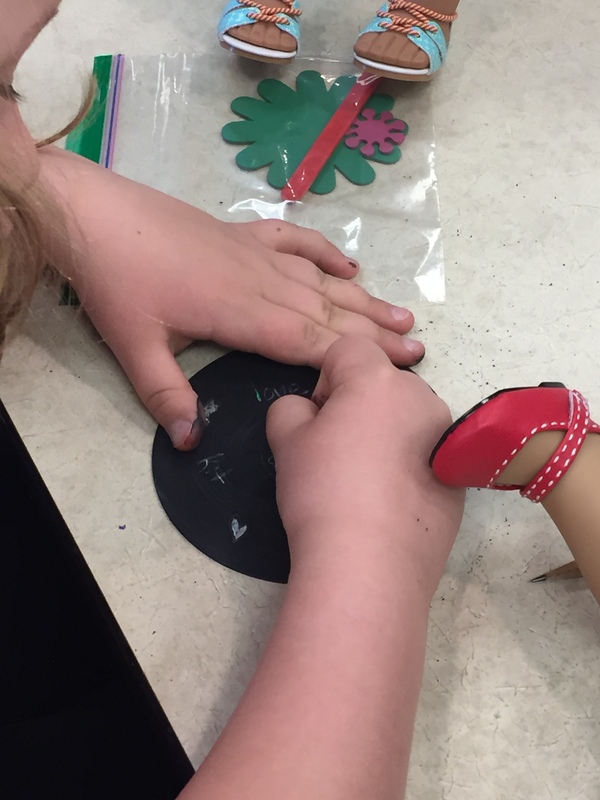 We used push pins as our etching tools, as I wanted the little hands to have some sort of handle on their utensil for etching. I would say to remind people that this is a time consuming project. It takes patience to etch away the black paint. I also think the older participants and adults enjoyed this activity more than my younger participants. I found this craft idea in Make Your Own Crafts: Eco-Crafts by Sally Henry and Trevor Cook. 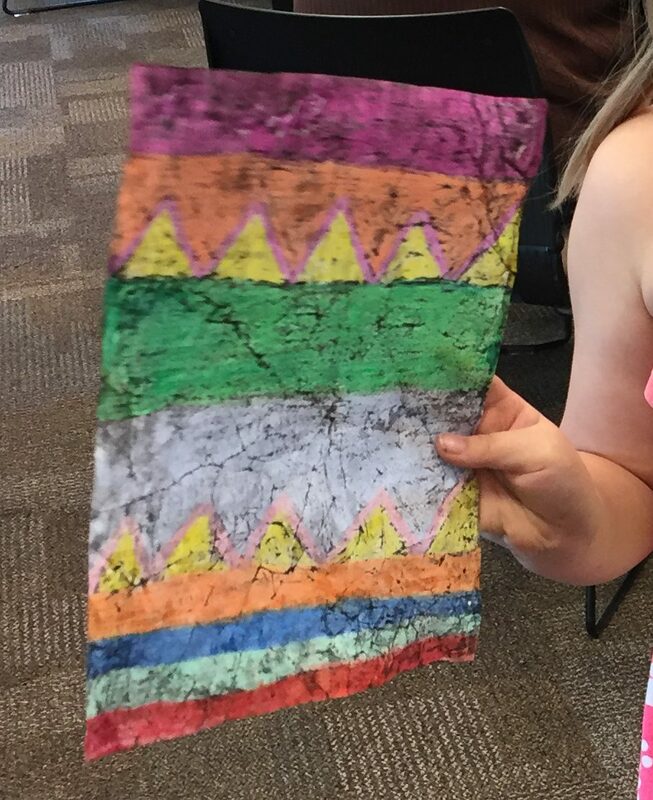 All you need is either coloring sheets or plain paper (I used scrap paper), crayons, water-based black paint, and paper towels. My participants colored a picture of their choice or drew their own design with crayons. The trick is to really color the entire paper and to color heavily. 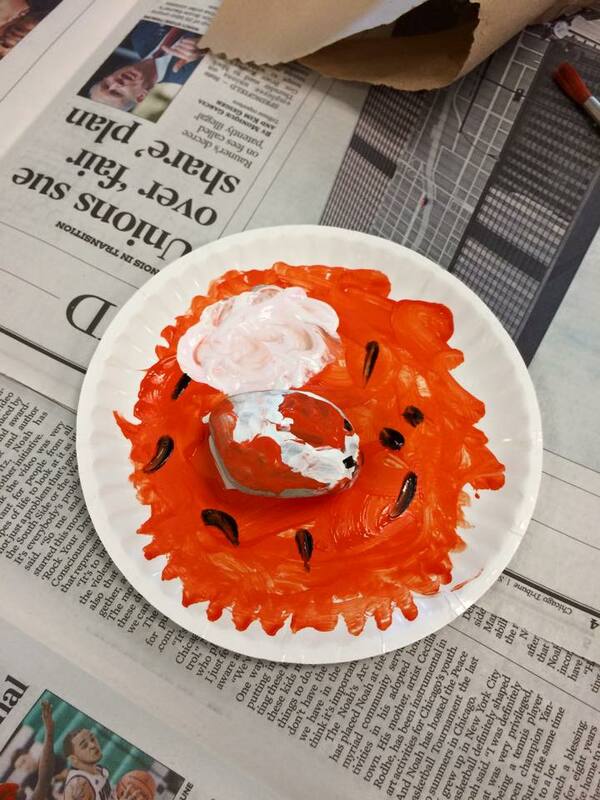 Once they finished coloring, the kids crumbled up their papers into a tight ball and re-smoothed it out. Once it was flat again, the kids then painted over their picture with the water-based paint. We had to water down our paint because it was a tad thick. If the paint is too watery, you can mop up the excess with a towel. We covered each picture with another piece of paper and then carefully placed the iron on top of the clean paper for a second. We would lift up the iron and press it on a new section. DO NOT IRON the paper or leave it on for too long. It will make the papers stick together. Once you have applied the heat pull apart the two papers. This was a favorite among the participants. I actually had several adults ask to see the book, so they could get the instructions to do at home. We had a patron who donated mini Altoids tins to our library. My co-worker originally was going to use them, but she graciously donated them to me for my program. I also had chalkboard paint. I only needed to buy the chalk for the kids. This was the clear winner for the kids. All they had to do was paint the inside of their tin. Ideally you would allow the tin to dry for a few hours and then paint another coat. We didn’t have that kind of time, so we would let the tins dry for about 20-30 minutes and then apply another coat. Some of the tins did have quite a bit of paint from some overenthusiastic painters, but it all worked out. Instructions can be found here. My last craft I unfortunately do not have a picture of it. One of my volunteers found wooden flowers of varying sizes. She created little baggies that contained one colored Popsicle stick, one big flower, and one little flower. The kids (really an adult) hot-glued them together. I think the next time I do this program I would like to incorporate making dirt cups. I just was a leery of how much time I would have for everything. This was my last American Girl Program for 2016, and I really wanted to do something extra special. I brainstormed for several weeks and realized that Molly allowed me to incorporate the holidays from October-December into the program. I also was afforded the opportunity to pair with my one of my coworkers to provide a special element with her own organization. 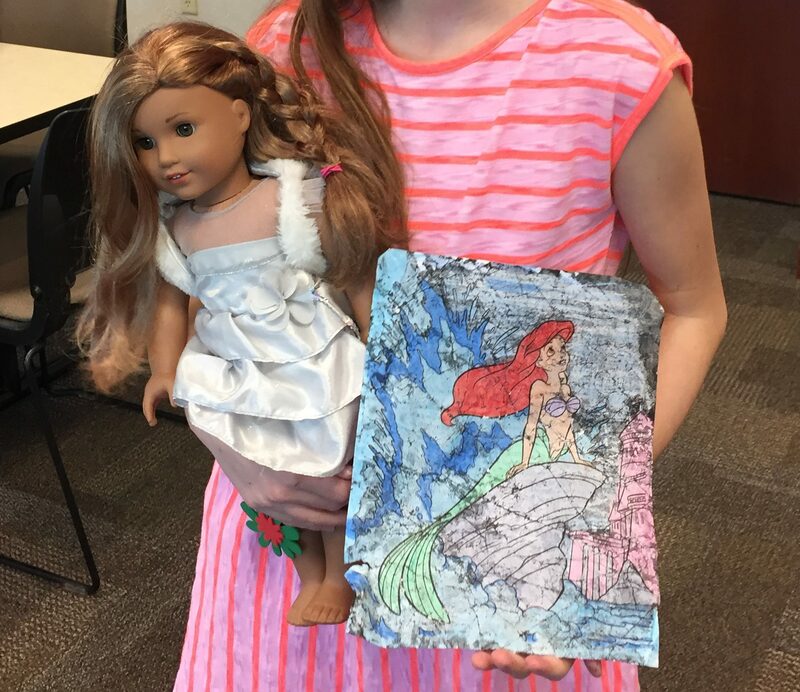 I thought because of Molly’s father being in the military during WWII it would be perfect for my participants to write letters and draw pictures for the military overseas. My coworker runs a Book For Soldiers (but sends out to all branches of the military), and I said I would have my people write their letters/pictures and she can put them in the care packages for the Winter Holidays! We also made up some goody bags! For majority of the year, she cannot send chocolate out, so we made sure to include chocolate. The second part of the program was for the participants to make their own hulu skirts in honor of Molly’s own hulu skirt for Halloween. We talked about how during WWII many kids resorted to making their own costumes. I found instructions at this site. I kept it fairly simply. I figured since Molly’s skirt was green then our skirts should be green! I found out that kids ate doughnuts and tootsie pops during Molly’s time. We also had Apple Cider, since Molly had Apple Cider during her Halloween! 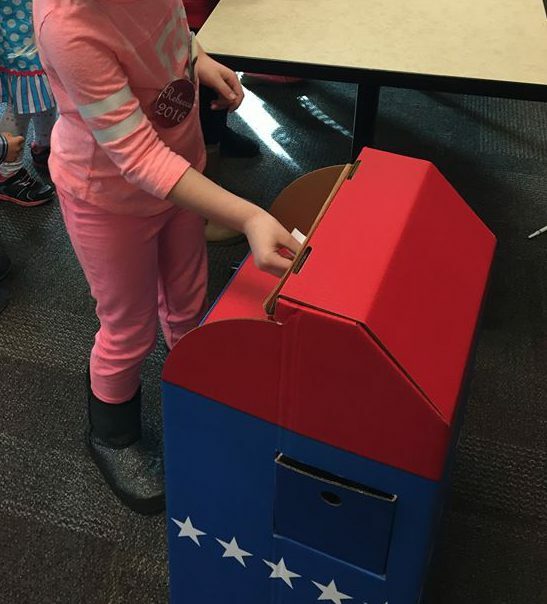 March was Women’s History Month and I thought it was only right to celebrate with having our own mock election. This was a double whammy as the United States is also in the midst of gearing up for the presidential election in November. I thought it would be neat to give my participants a tiny taste of what goes into voting. I definitely steered clear of using any of the potential candidates. Instead I picked Rebecca and Samantha as our candidates. I thought it was appropriate to use these two American Girls, as they were both alive when women received the right to vote. For my set-up, I changed it up from the normal pods. I instead made two long tables and assigned participants to a specific party. Rebecca was the purple party, and Samantha was the pink party. I did this because I did not want a specific party to have way more people than the other party. Once everyone was assigned to a table, I did a mini lesson about why women didn’t have the right to vote and how they eventually gained the right to vote. I then explained that the two parties were going to campaign for their doll. I explained that while they would campaign for one doll they could always vote for the other doll. My chosen activities were Campaign placards and buttons. They could also make mini buttons! She likes to help others. She taught her friends to read. Afterwards, we had everyone vote. While we counted the ballots, we fed them cucumber sandwiches and pink lemonade. Very reminiscent of the time. We kicked off 2016 with the girl of the year, Lea Clark. Since Lea Clark is big into taking pictures, we wanted to give our participants the opportunity to flex their own photography skills. Unfortunately, we only had one bona fide camera, so we opted to also use the camera in the ipads. My helper would take a group of three girls out around the library for about 5 minutes and give them the chance to take pictures of things they liked. We would then upload their pictures to the computer and have them pick their favorite picture. About a week later I had printed off all their pictures. Warning: this activity is very time consuming and we did run about 10 minutes over. 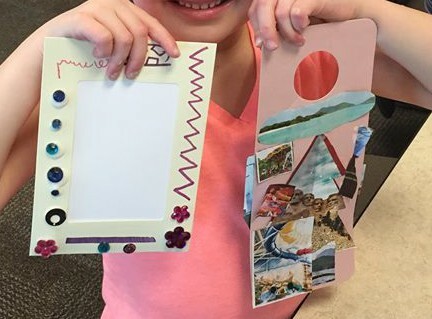 While the kids rotated out for pictures, the other half of the kids worked on their picture frames and destination door hangers. 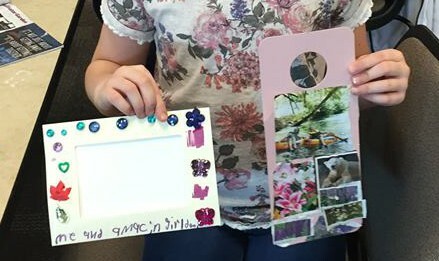 Obviously, the picture frame was meant to house their awesome pictures, but the door hanger let them show off their collage skills. We had grabbed a bunch of magazines that showcased fashion, travel, and animals. They could put on their hangers where they would travel, what they would pack, and what they would see. Our snack was Brigadeiro! I had a blast making this Brazilian delicacy. You can either eat it when it is goopy hot, more like a caramel, or like a truffle. I was not comfortable with making it as a truffle, so I went more for more a caramel. I used the recipe from allrecipes.com but did some research. It is recommended that you use a Nestle chocolate instead of the unsweetened chocolate. 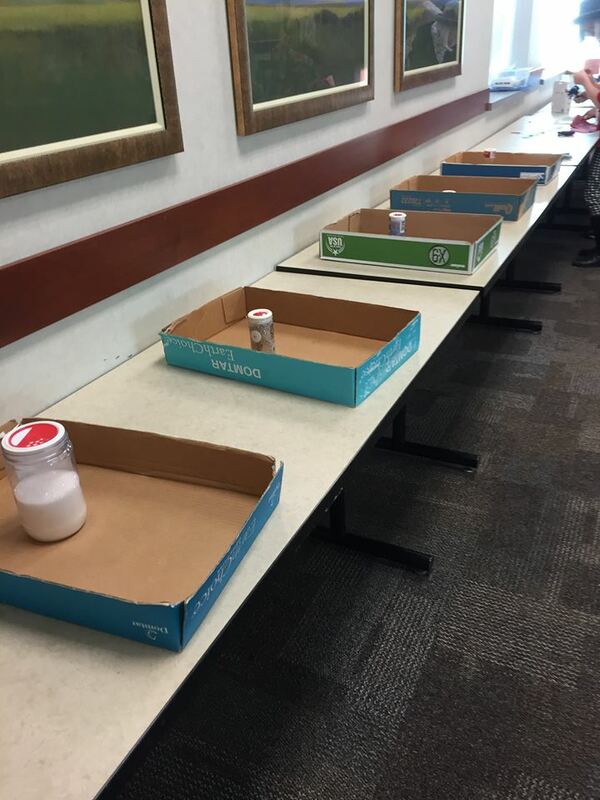 The Odyssey Online gave a great outline with pictures on how to make this delicious treat! 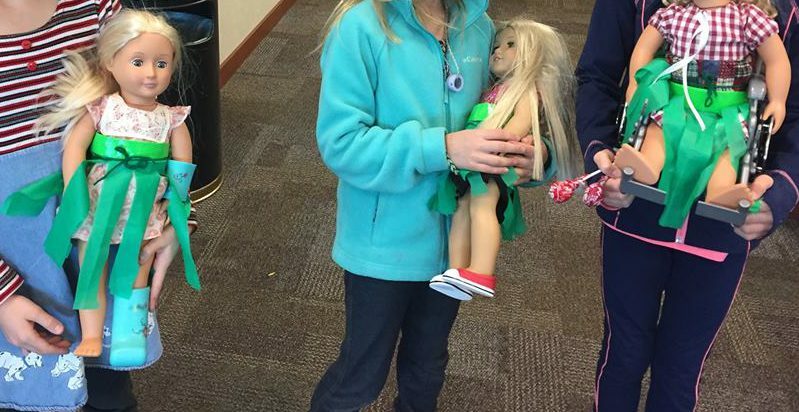 Sigh, our last American Girl for 2015 was Maryellen Larkin. I thought it would be appropriate to include her for one of our 2015 sessions, as she is the newest Beforever Doll. I immediately decided to do a 1950s Christmas. I knew that poodle skirts were essential and since Ms. Larkin wanted snow, we would give her snow. After our traditional powerpoint, we started on the poodle skirt and scarves. I knew this would take longer and wanted the kids to start immediately. I thankfully saved time by having all the felt already cut. The instructions called for a felt poodles, but I didn’t have the time to really cut out 30 plus poodles and went with snowflakes, flowers, and hearts. Thank you die-cut machine! The girls were each were handed a skirt and scarf. Then each girl got to pick up to five felt pieces to go with their skirt and scarf. The longest portion of this session was the glue gun. 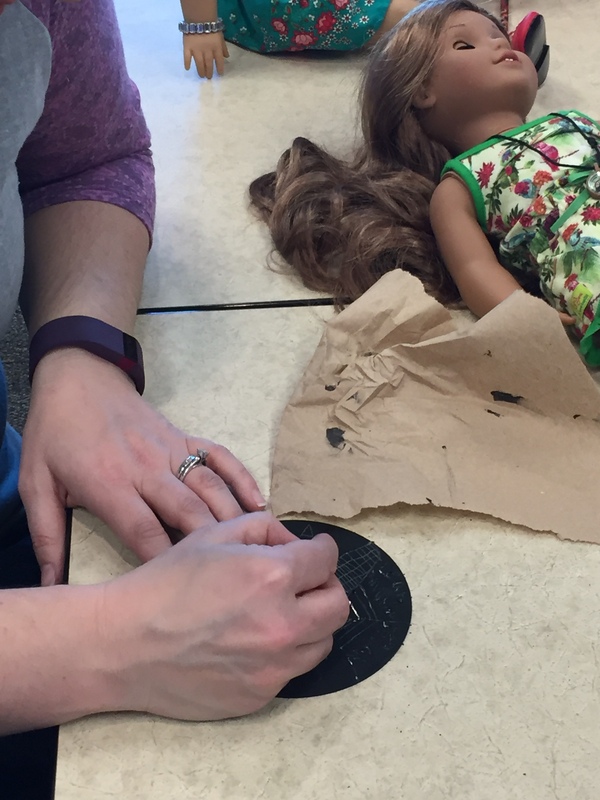 I really do not allow the girls to handle the glue guns (I don’t want to explain to a parent how their child got a burn blister), so I rely quite a bit on the adults to assist. I also only had a limited amount of glue guns. I did fix this for future dates. 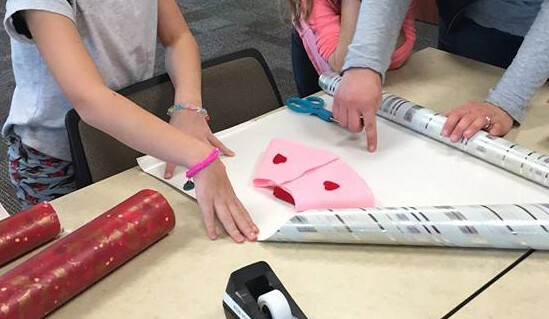 Once their felt pieces were glued down, the girls then got to wrap their skirts and scarves for Christmas! I had three different Christmas wrapping paper out. I wasn’t sure if they would like this portion, but they loved it. I was told by several parents/guardians that their girls were very excited to put their presents under the tree and were just as excited to open them on Christmas Day. 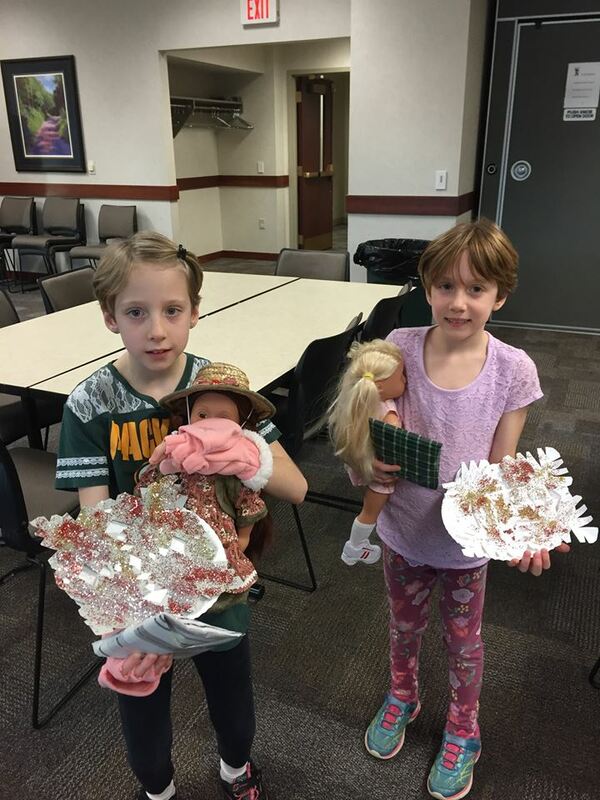 The second activity was snowflakes. 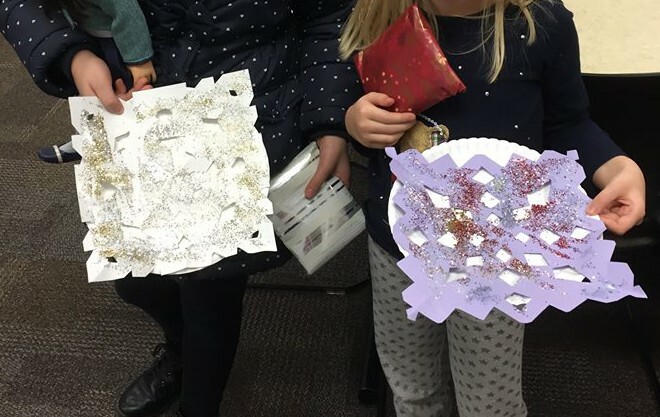 Never doubt how much fun kids have making snowflakes out of paper. To throw in some extra excitement, I also did glitter! You either hate glitter or you embrace it! I embrace it and the more the merrier. The final portion of this session was cookies! 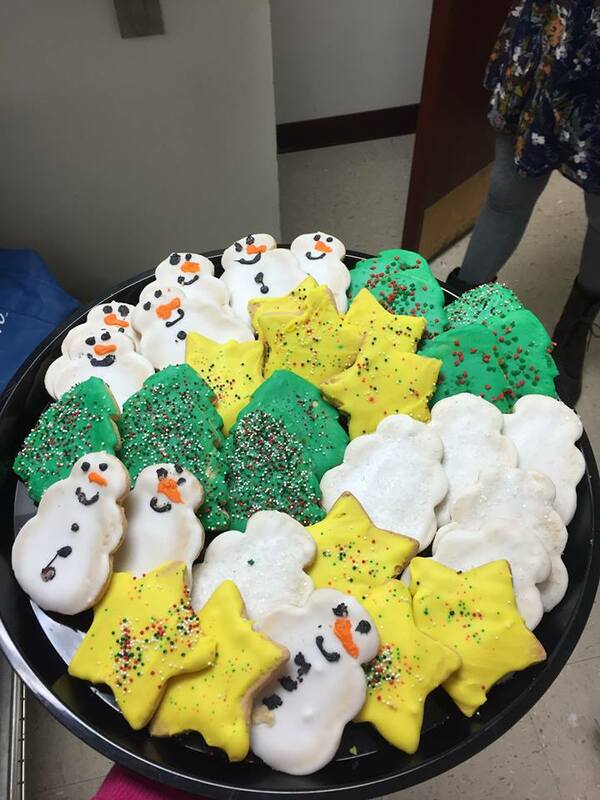 I ordered Christmas cookies from a local bakery and made lemonade. It was a great way to end 2015. 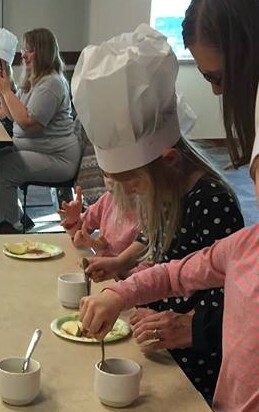 No cooking program should ever be complete without a chef’s hat! I gave the kids the option of making the chef hat for themselves or their dolls. Most of the kids picked making the chef’s hat for the doll. This is where I got the instructions for our hats. My hat turned out ok.
After we made our hats we moved on to our apple pie crescent rolls. Everyone became super excited for our first recipe. I do recommend going heavier on the sugar and doing a test at home to figure out what works. Our last activity was ice cream in a bag. This one was a bit trickier. I did a test run at home and everything went well. However, once at the library, the bags we were using kept leaking! I literally have no pictures from this segment because I was running around getting new bags to put the leaking bags into. This month’s activity was super fun but exhausting. I resumed my American Girl series after our summer reading program and boy, was I excited for what I planned for October. Día de los Muertos! My brain exploded with ideas. I knew Josefina would perfect for this with her storyline. I started off with my traditional powerpoint. I briefly touched on Josefina losing her mother and how she most likely celebrated Día de los Muertos. I also discussed the customs and traditions celebrated today. 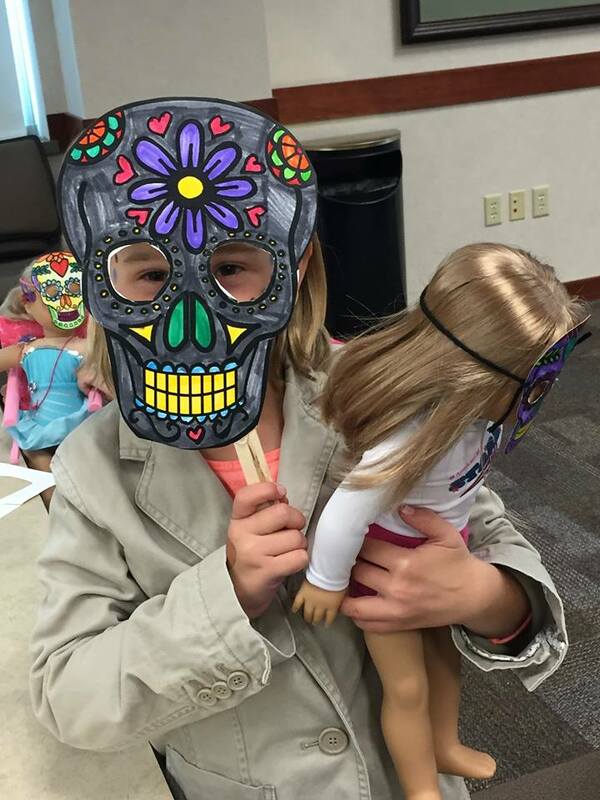 Our first craft was to make a calaveras mask for the participants and their dolls. I found this template. 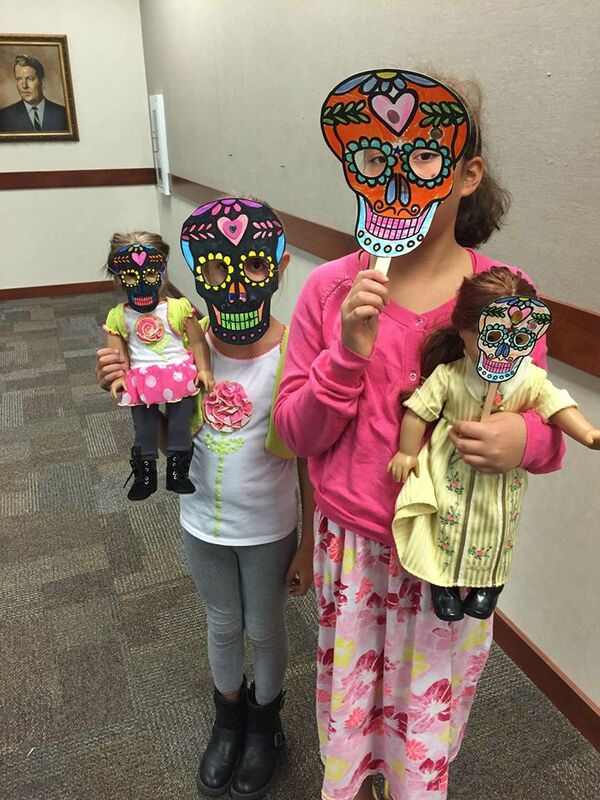 I printed off both the flower and heart mask and downsized the original mask to fit the dolls. I put out markers, sequins, and glue for decoration tools. I saw some pretty cool masks. 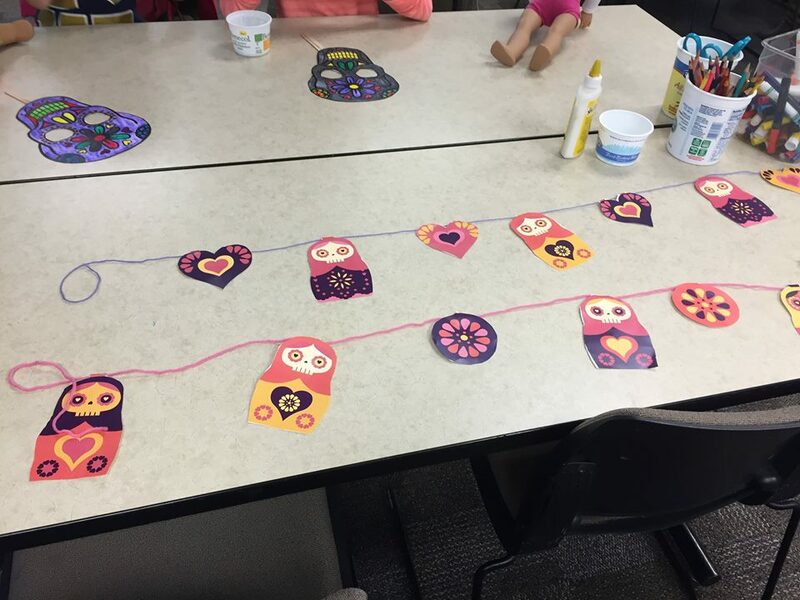 Our second craft was nesting dolls. I wanted a craft that would be slightly more modern. I also liked that it correlated with the decorating of the graves on Día de los Muertos. 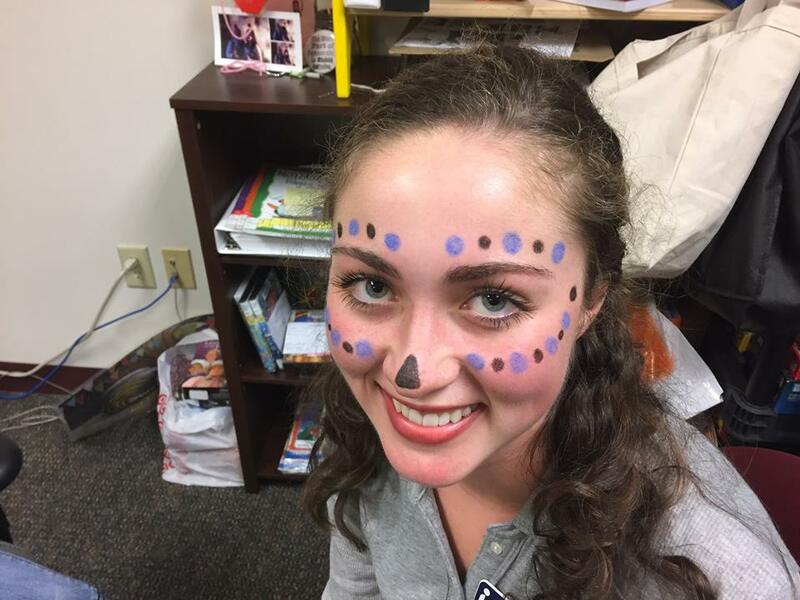 To add an extra bit of flair to the program, I also incorporated face painting. I choose a simple design and had my two helpers keep to this one choice. At first no one was getting up to get their faces painted, but soon there was a line with ready participants. Here is an image of my helper’s makeup. I wrapped up the event with some hot chocolate. My research showed that hot chocolate or champurrado are popular drinks during this holiday. This might have be my favorite session yet. The girls had a blast and it went very smoothly. Alright, work has been extremely busy with summer reading program, and I have fallen off the wagon with updating. I’m going to try and catch up by doing at least a post week (hopefully two). My final American Girl program was focused on Julie Albright. I figured we could end the spring series with some disco dancing, pet rocks, and tie-dying. I did my traditional opening with a brief powerpoint about the Julie’s era, the 1970s. After introducing Julie, I then talked about how popular pet rocks where during this time. 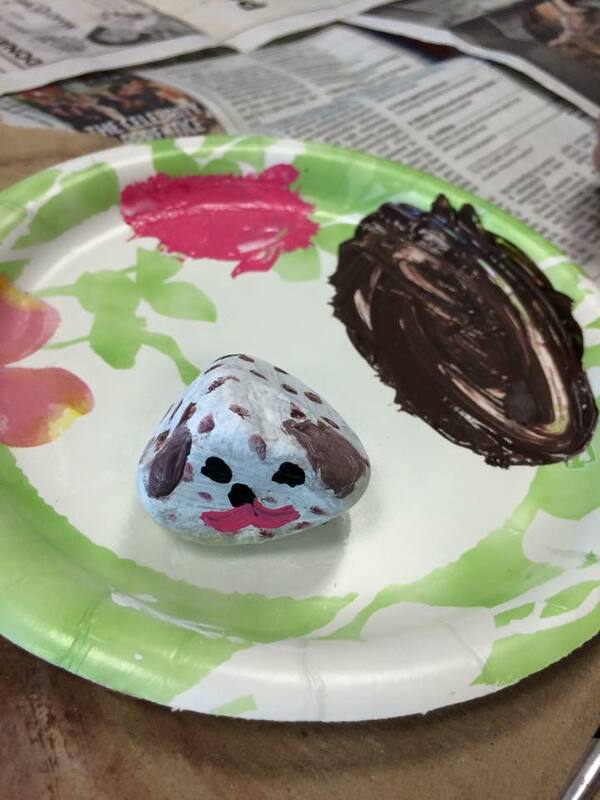 I gave a brief history about how pet rocks got started. 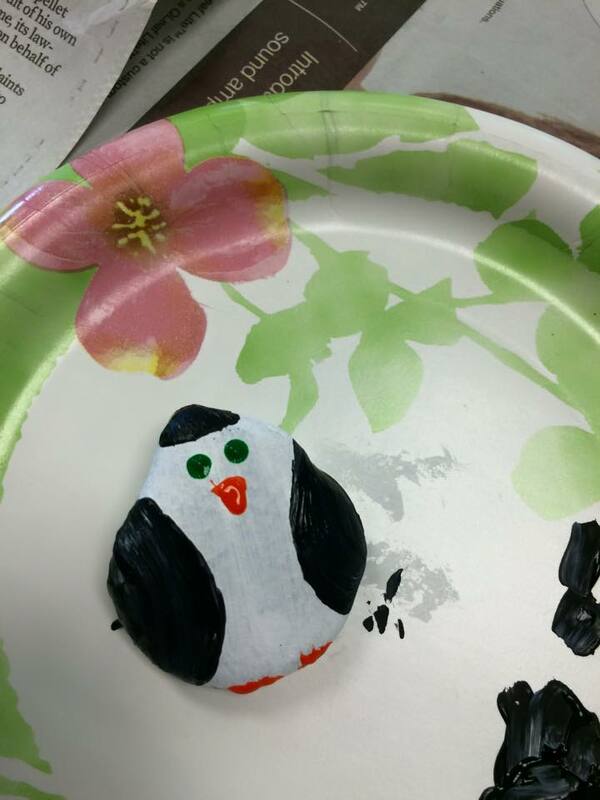 I then let the kids and their adults loose to paint their own pet rocks. 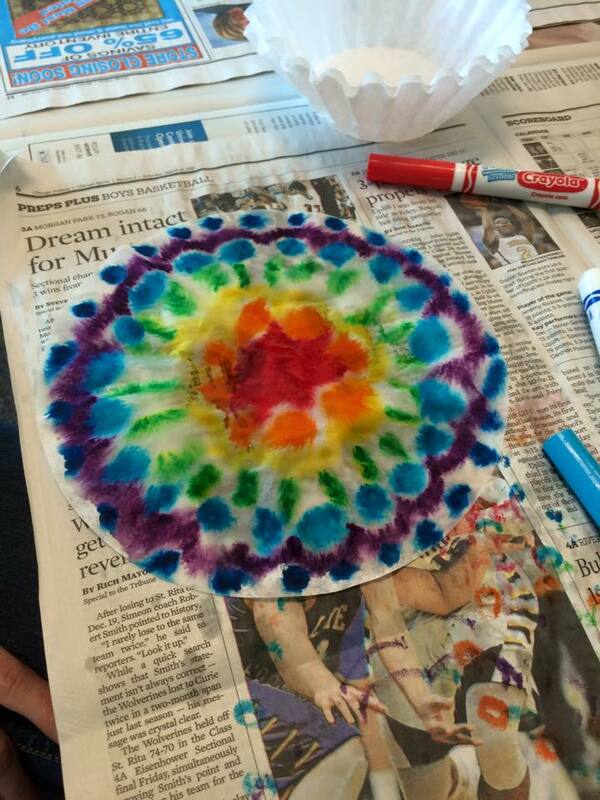 After our pet rock project, we moved on to tie-dying (how could we not). There were quite a few chuckles from the older crowd. 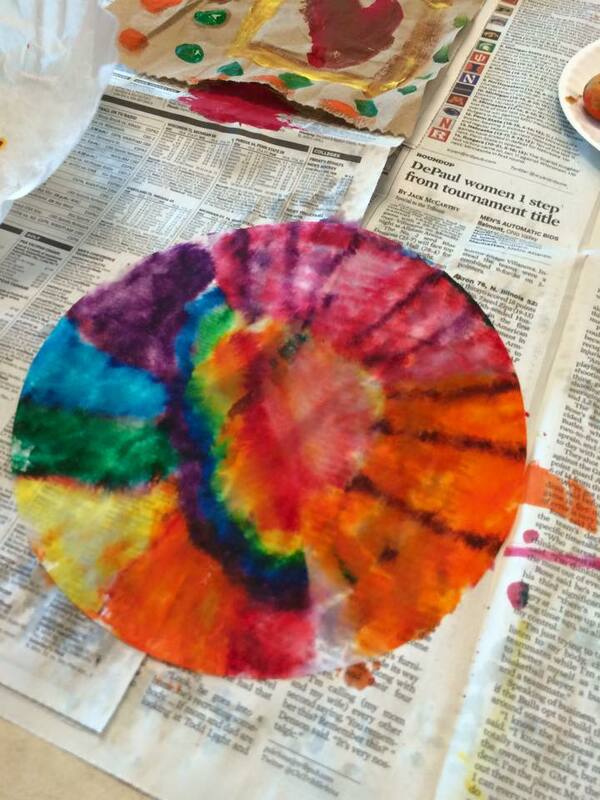 I would have loved to actually tie-dye shirts, but coffee filters are just as fun. I had the crowd decorate their coffee filters (each person got three) and then my helpers walked around and spritzed each filter with water. We saw some really groovy combinations. We finally ended with a mini party. I served Doritos and root beer to the kids. I always knew that Doritos was popular, but who knew how crazy the kids would go for their own batch. I actually had to give five girls Oreos because I ran out of Doritos. Next time I will buy three party bags instead of just two! I then threw some ABBA on and let them have their own dancing party.